We’ve got jewelry galore! Shop for necklaces, earrings, brooches and more to adorn your ensemble. Find a fun piece for everyday or collect an heirloom to hand down to your cat crazy kids. Make sure to come back April 6 to start placing your bids in our online auction that will close at the event. 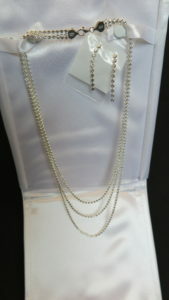 Three strand sterling silver necklace with matching earring set from Gold Mine Jewelry Shop.